Kitchen herbalism is quickly becoming one of the most accessible and empowering ways to care for your health, and the health of your family, through incorporating herbs into simple cooking and baking practices. The addition of both common and unconventional herbs to beverages, whole foods, and baked goods allows the medicinal and nutritional benefits of herbalism to be appreciated and enjoyed by all members of your family. With the guidance of these fabulous and creative kitchen herbalists and wild food experts, bringing herbs indoors and transforming them into delicious edible treats has never been easier! Herbalists are listed in alphabetical order by first name. Living in the sub tropics allows me access to fresh herbs for most of the year. Even now, as winter is reaching its zenith here in the southern hemisphere, I can still harvest from my garden whenever I wish. It is nothing like the lush abundance you in the northern hemisphere are about to face. You are coming into the time where potent healing powers are at their maximum for many plants; cultivated and wild alike. So while you busy yourself with preserving your bounty by drying, infusing, and freezing your herbs do make sure you also use these little powerhouses in their fresh form while you can. Summer temperatures often leave us reluctant to cook big meals, which just sit heavy in our bodies anyway. The heat and activities of summer make liquids so much more appealing. Cold drinks and soups can be very nourishing and very light too. I’m a big fan of smoothies and have many recipes that follow different techniques/eating plans. There is a German one that utilizes milk, like the standard smoothies of old…. 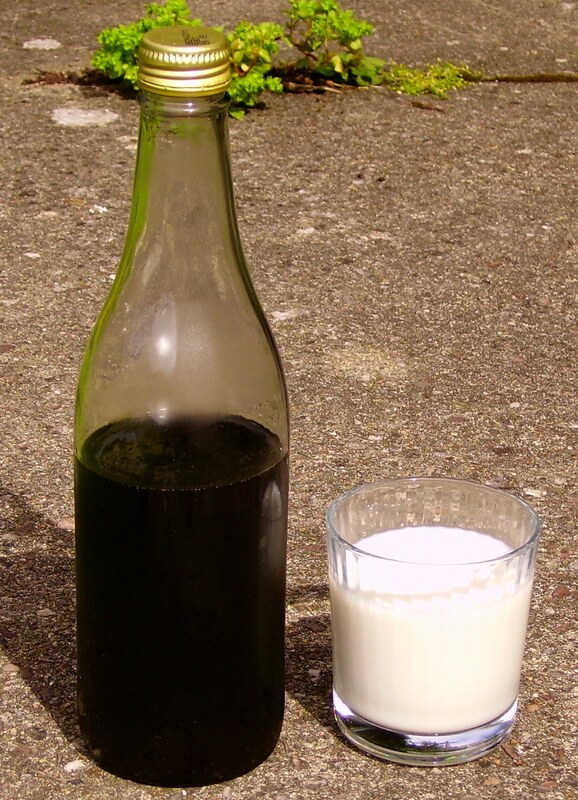 A lot of people now like to stay away from dairy, or animal products in general, so the milk would not work. 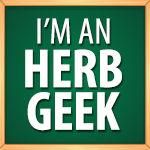 I personally like to also be more specific with the herbs I use so that I can use them in my diet with more purpose. My approach to herb use in the kitchen has always been one of knowledge and prevention. 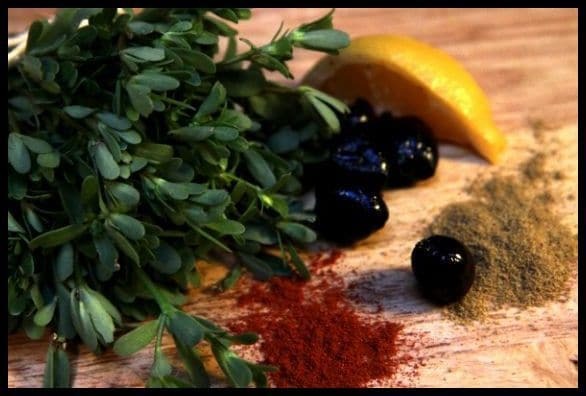 You will find that you already use many different herbs in your kitchen purely for taste, so it is just a step further to learn what these herbs can be applied to medicinally speaking. Once you know the medicinal applications you can use them to target and prevent health issues your family might be facing. A friend of mine is vegan and therefore doesn’t eat dairy. For his smoothies he likes to use tofu for a creamy, thicker consistency. Don’t like tofu? How about chia seeds? They will quickly turn quite gelatinous and once added to your smoothie will give you a thicker drink. Last but not least, the trusty banana gives a smoothie that creaminess we all like. But where are the herbs? If you have ever tried juicing herbs you’ll have found that it takes an awful lot of plant material to squeeze out a few drops of precious herb juice. As much as that is a very potent liquid and not much is needed, it is a wasting a lot of potential (not to mention fiber). I like to make a strong herbal infusion, chill it and use that as my liquid base for my smoothie. 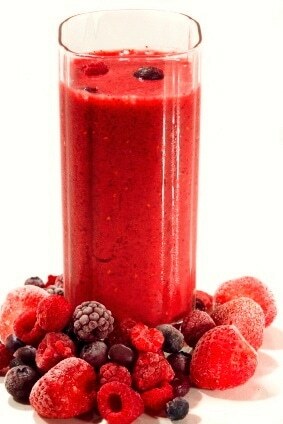 The left-over leaf material can also be added to the blender with your choice of fruit, so that nothing gets lost. If you add more mashed banana to the mix, this also makes a yummy summer herb popsicle. What herbs you use in your smoothies is entirely up to you. Peppermint is very cooling, lemon balm is calming, rosemary is energizing… it all depends on your needs and your taste buds. Another quick and easy way to utilize herbs in your effort to keep hydrated while you delight in your harvests is to make your own vitamin water. Pick a fruit/herb combination that appeals to you, chop into chunks, pop into a jar, cover with spring water and leave in the fridge overnight. The next day you’ll have tasty, refreshing and healthy vitamin water to see you through another sweltering day. Summer is a time to slow down to the pace of nature, be outside when we can, and savor the long days. Mint family herbs such as basil and peppermint help us to cool summer heat. Coconut is soothing to the digestive tract and cooling as well. Cinnamon, a powerful astringent and carminative herb, supports the digestive system that might get overwhelmed by heat and helps process essential nutrients. Enjoy these recipes and remember that, when you cook for yourself, you tend to feel better, save money, and stay healthier throughout the seasons. 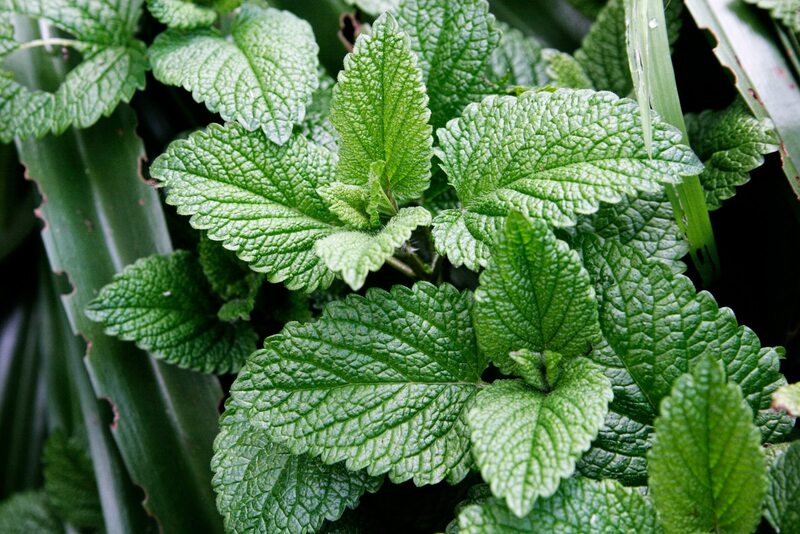 Mint: stomachic, and cooling, it relieves indigestion, dyspepsia, and colonic muscle spasms by relaxing the smooth muscle tissue of the intestines. Essential oil of peppermint also stops the growth of many different bacteria, including helicobacter pylori and almonella enteritidis. 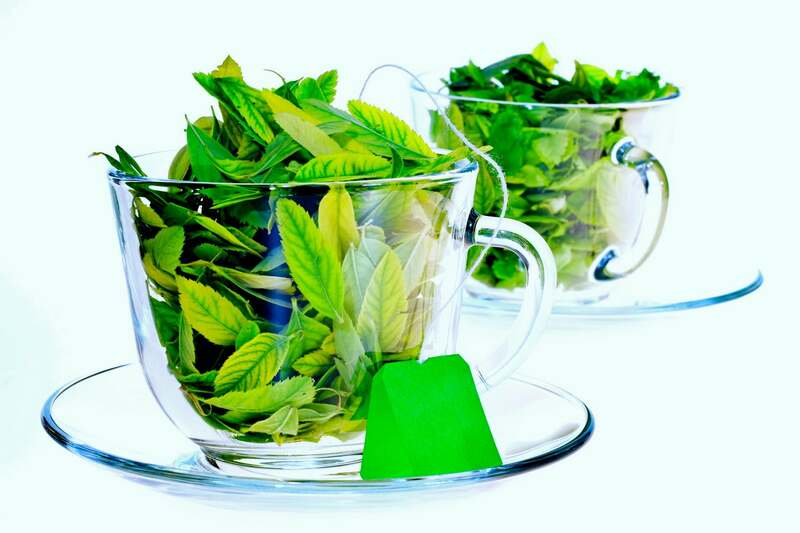 Peppermint contains rosmarinic acid, which opens bronchial passages and reduces the effects of allergy-induced cold symptoms. To prepare this simple summer dessert, pit the plums and set about 1 cup of them aside for garnish. Add the rest of the plums and all the other ingredients to a sauce pot. Simmer on medium heat for 10 minutes, stirring occasionally. Keeping all ingredients in sauce pot, add agar agar flakes and cook on medium heat for 5 minutes, whisking to help the mixture thicken. Pour into serving cups and allow to cool and set. Garnish with fresh plums and serve. Delicious! Almonds: high in monounsaturated fat, which promotes heart health, helps reduce LDL cholesterol, and aids in carbohydrate metabolism, thus contributing to weight loss; contain flavoproteins (such as riboflavin) to maintain balanced blood sugar and improve energy levels. Cinnamon: anti-microbial activity specifically reduced overgrowth of candida albicans yeast; helps maintain steady blood sugar levels and boost brain function. 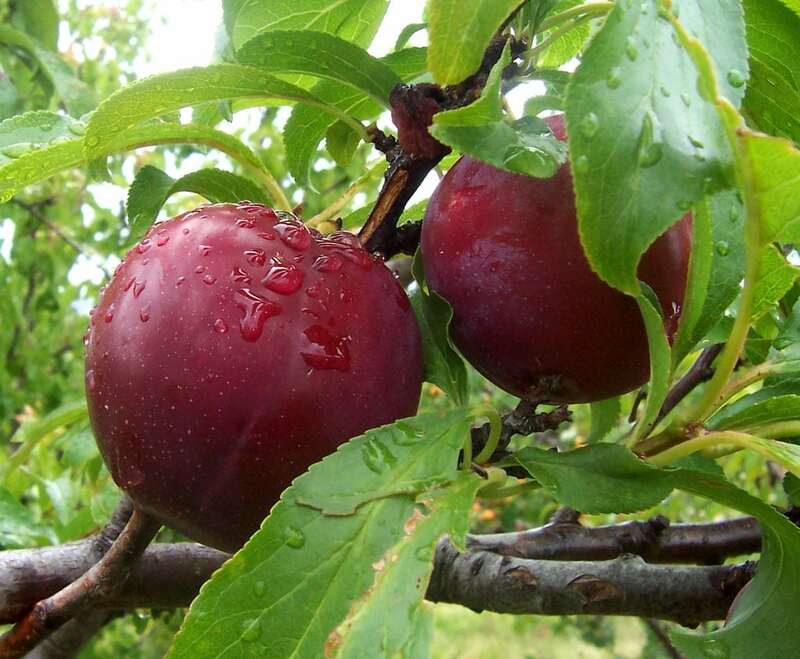 Plums: strengthen immunity and enhance overall health with power-packed antioxidants; support brain function and offer acid-alkaline balance in intestines. 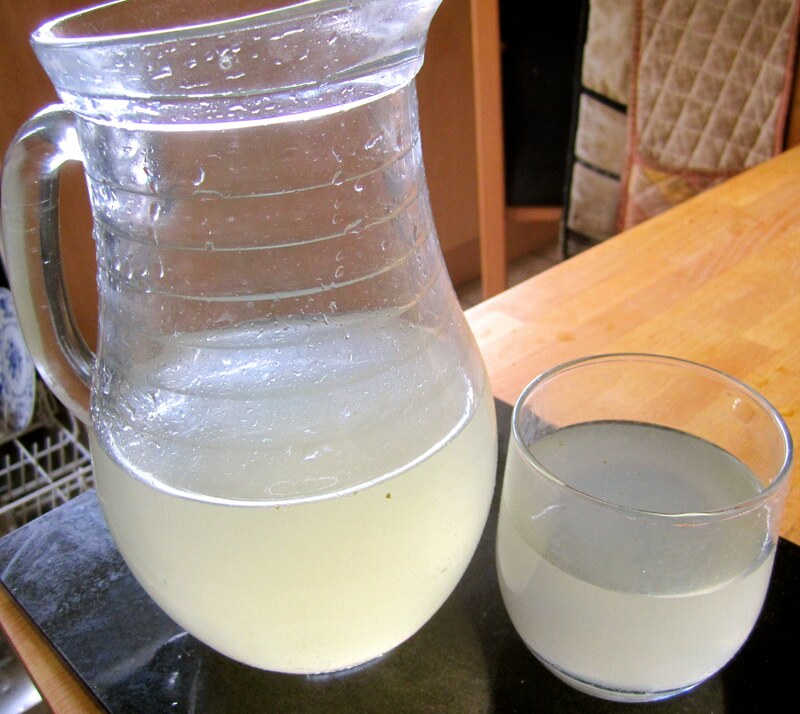 When I was a child, on one hot day each year, my mother would make real lemonade from sliced lemons marinated overnight in a sugar solution and chilled. 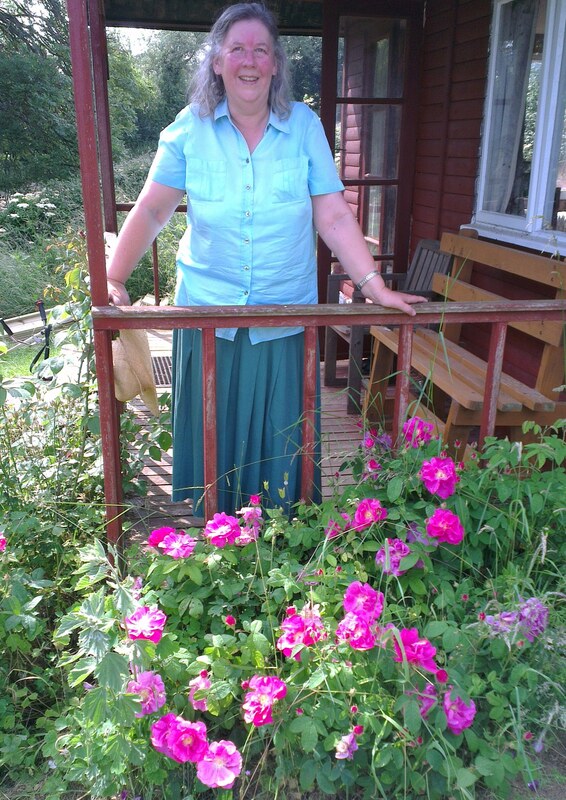 Summer was the busiest time of the farming year, so we rarely went on holiday. Instead we were left to our own devices while our parents brought in the harvest and looked after livestock. The lemonade tasted so different from our normal blackcurrant cordial. We never had any fizzy drinks because my grandmother had once worked in a shop which made their own and she disapproved of paying for carbon dioxide piped into flavoured sugar water. 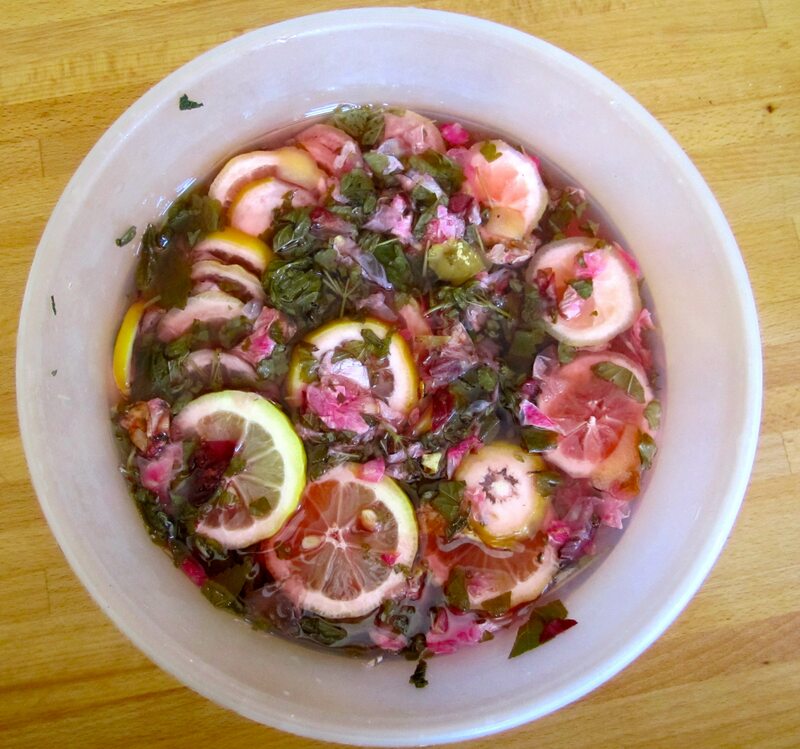 Now summer is here again, I have resurrected that childhood memory of lemonade but perfected it by adding some of the sun-drenched herbs in my garden. Pour your rose syrup either into sterilized glass bottles or clean plastic bottles and immediately freeze. The glass bottles should be sealed, labelled and dated and kept in the fridge once open. Dilute to taste with still or sparkling water. One of my garden beds is overrun with Swiss mint. The flavour is too strong and metallic for mint sauce but it makes a wonderful mint vinegar and mint and lemon honey which can be combined for an oxymel. I thought I would experiment to see what a Swiss mint cordial would taste like. It was a great success! Pour your mint syrup either into sterilized glass bottles or clean plastic bottles and immediately freeze. The glass bottles should be sealed, labelled and dated and kept in the fridge once open. Dilute to taste with still or sparkling water. One of the strangest summer recipes I came across was for a 1947 cough/throat remedy made from roses and nettles served with milk. I was dubious fresh nettles could be found at the same time roses were blooming but if you keep your nettle patch well harvested, there will be young growth available when you pick your roses. 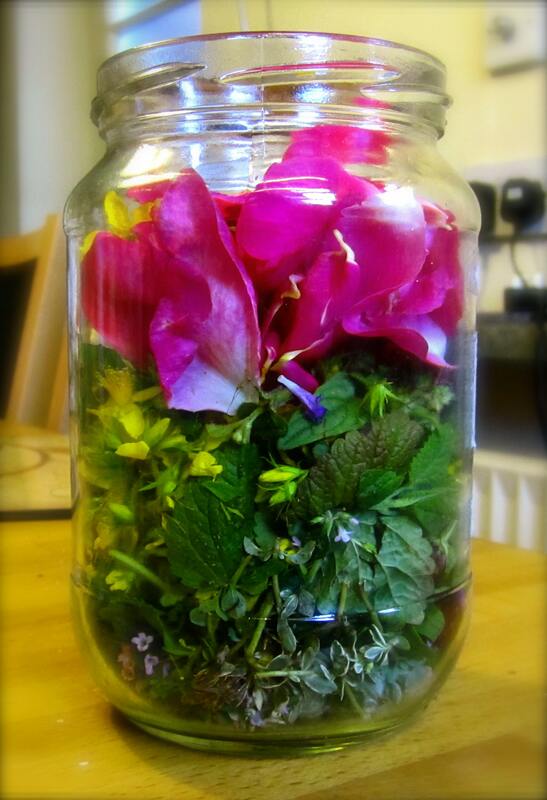 The syrup can also be made from dried nettles and rose petals if you need a fix in the dead of winter. Place the nettles in a bowl (and other herbs) and cover with cold water. Cover and leave overnight in a cool place. The next morning tip the entire contents of the bowl into a large saucepan. Cover and bring to the boil. Simmer for twenty minutes then strain the liquid into a jug, discard the herbal matter and wash the saucepan thoroughly. Measure the liquid, return it to the saucepan, bring to the boil and simmer uncovered on a low heat until the liquid measures 2 UK pints (20 fl.ozs). Add the sugar and all the rose petals. Bring back to the boil simmering and stirring for approximately 15 minutes until the sugar has dissolved and the rose petals have given up their colour to the syrup. 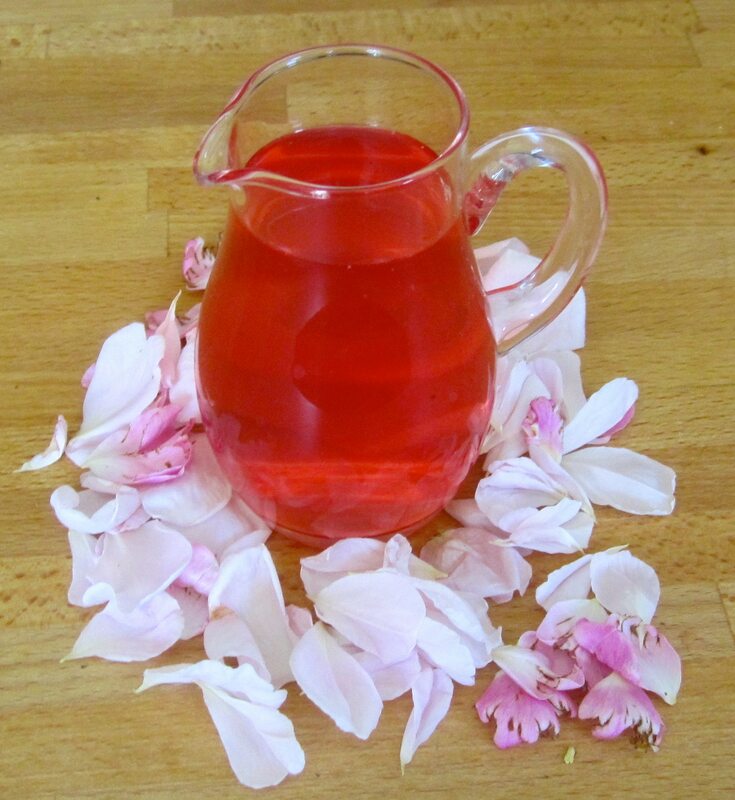 Strain off the rose petals and pour the hot syrup into hot, sterilized bottles. Seal, label and date. Allow to cool. Add to a glass of cold milk an amount to give your desired level of sweetness. (The original recipe says 1 tsp per glass but I like 1 tblsp!) Store opened bottles of syrup in the fridge. Unopened bottles should be ok in the larder or a cool cupboard. 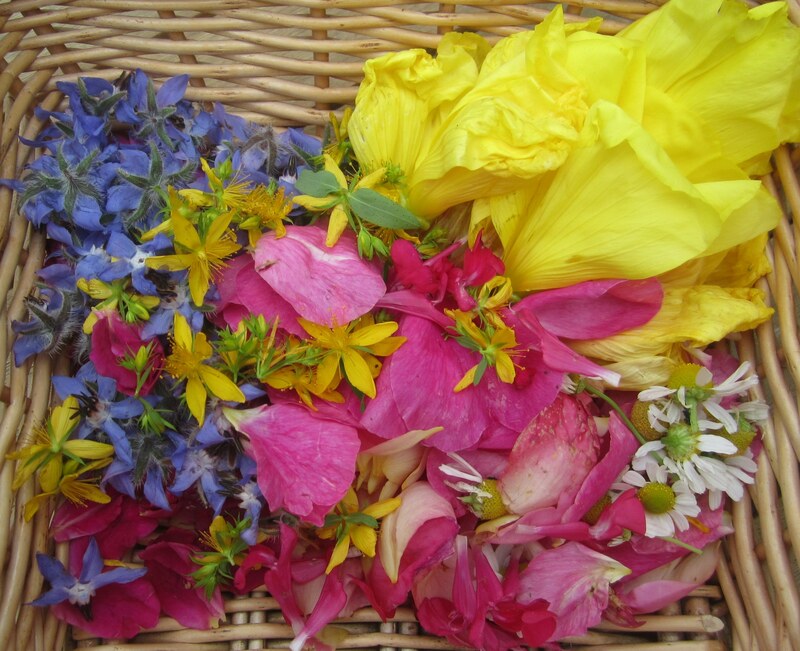 When you have a garden or open space full of herbs, there is nothing better than wandering around with your gathering basket and a pair of scissors in the cool of the evening collecting flowers from different plants to create a unique elixir. So many herbs offering us a myriad of wonderful combinations to enhance our lives not only in summer but all year round. By the time Summer is in full swing here in Southern California, I’m usually reduced to being a big overheated grouch. The longer days and high heat seems to drive more and more people outdoors, but for me personally, its a time for sitting around and grumbling about how the mountains are too hot to hike in, and that my wildcrafting choices are becoming more limited. I’ll chase the cooler temperatures to higher and higher altitudes until the fall, thankful for things like sea salt in my water, and a big wide brimmed hat. I do keep going out though, despite my aversion to such hot days, because there are two things to gather that I wouldn’t miss for the world. 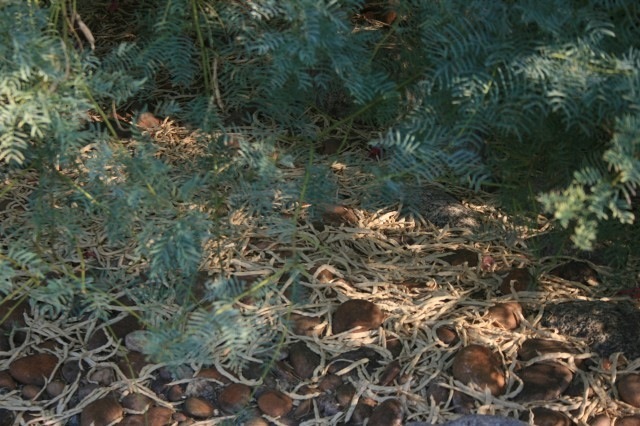 My favorite things to gather in the summer are elderflowers and mesquite pods. 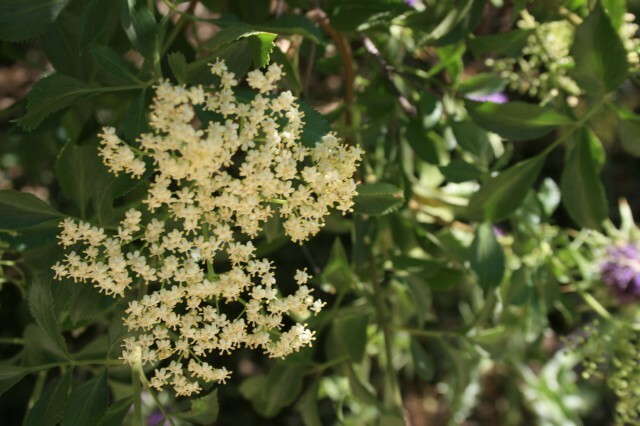 Elderflowers for me signify the beginning of the summer, and the mesquite pods herald in the transition to fall. The former, you’re most likely aware of, as they grow everywhere. The latter is strictly a desert food and medicine plant, but one that I’d be hard pressed to do without. Luckily, you can find it at health food stores everywhere, so even if you can’t wildcraft your own, you can still cook with it. The first thing I do with a batch of elderflowers, upon returning home (after I’ve left them outside overnight so that the little bugs that like to hang out in them can be on their merry ways) is detach them from their stems. After a night they’re usually really easy to pick apart. 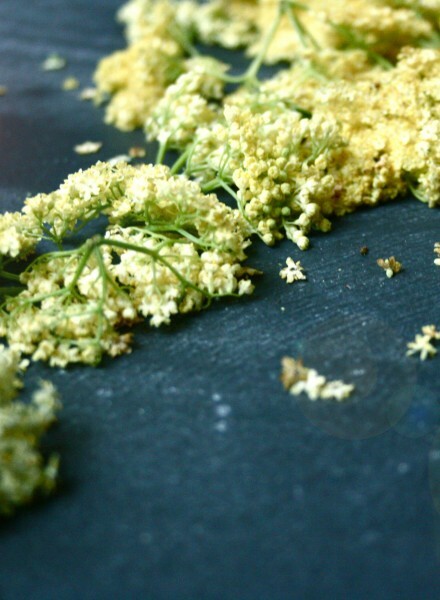 And then I’ll have a big bowl full of elderflowers. A quarter of them I will use for tinctures– half for elderflower tincture straight, and then the other half gets distributed into batches of Elderberry Immune Elixir. Another quarter gets set aside for cooking, and then I’ll dry the rest for teas and infusions. With those that I set aside for cooking, the first thing that I make is a batch of elderflower cordial. It is one of the most versatile things in my pantry– delicious poured over ice cream, to glaze meats, as an addition to fruit salads and custards and pies and tarts, and also (my favorite use) in drinks. 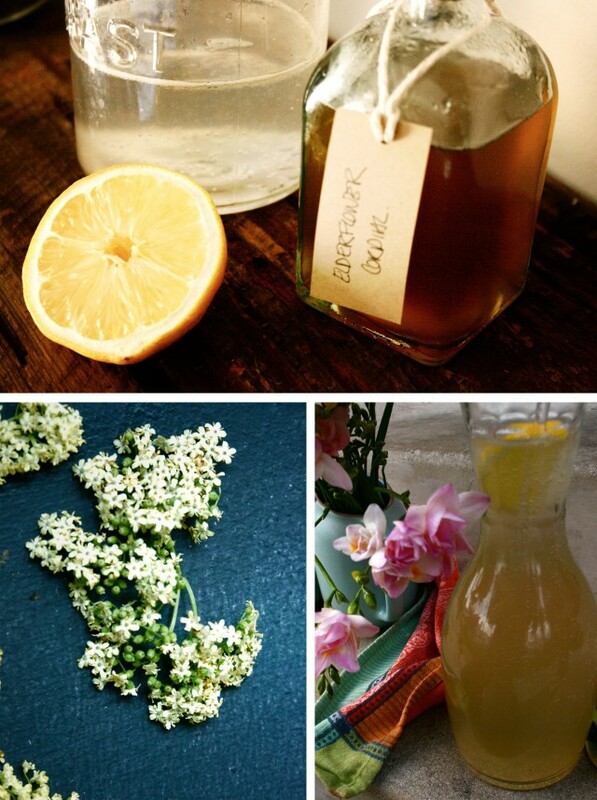 Here are a couple of my tried and true elderflower cordial recipes. Bring the water and sugar to a boil and then remove from heat. Add the elderflowers and leave to cool. Heat up once more, adding the lemon juice, and allow to cool overnight, then strain out the flowers, squeezing to make sure you get all the syrup out. Pour into bottles and refrigerate. It’ll last months in the fridge. light rum- add to taste. For my lightweight version I used about a tablespoon. Lu used about 1/3 cup. 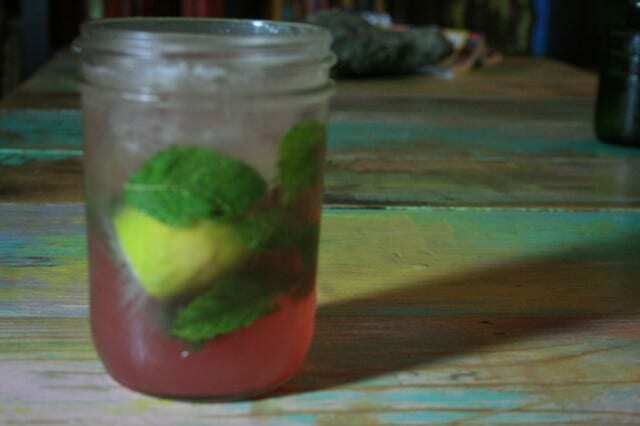 In the bottom of the glass, add a teaspoon of sugar, 4 quarters of lime, the blackberries and the mint leaves. Using something sticky and *poundy*- I used my wooden thing for my juicer, but the end of a spatula would do, as would the end of a thin rolling pin- start mashing it all together. You want most of the juice out of the lime, and the mint to be pretty beaten up, and the blackberries to look like a gruesome murder scene. Then add the syrup. Fill the glass with ice, then add the rum, and top up with soda. Garnish with a straw and a warm evening and maybe three other people to share these with (though this is not entirely necessary). 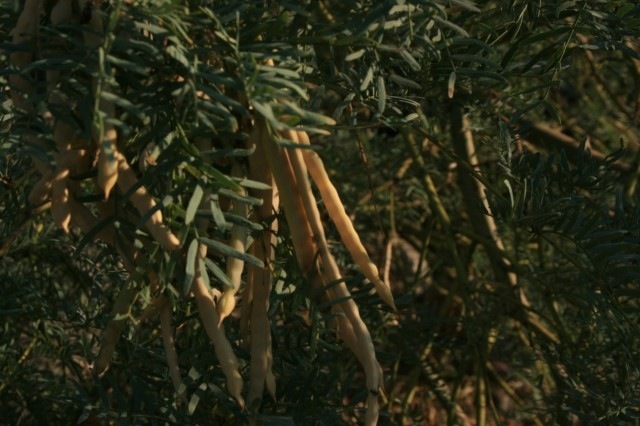 Mesquite pods grow in the Southwest deserts in abundance, and they’re very easy to spot when they’re ready to pick. I gather as many as I can fit into a couple of shopping bags, and dry the majority of them out to use for food, though I’ll keep some on hand for medicinal purposes– they’re a fantastic astringent with some antimicrobial properties that make them very useful for wounds and eye infections, not to mention stomach upsets and such. Processing them can be a pain in the backside– you need a very good blender, and they need to be fully dry before grinding into flour, but once you have said flour, there’s no limit to the wonderful things you can do. The standard is to substitute 50% of whatever flour mix you’re using with mesquite and it shouldn’t mess up the chemistry too badly. 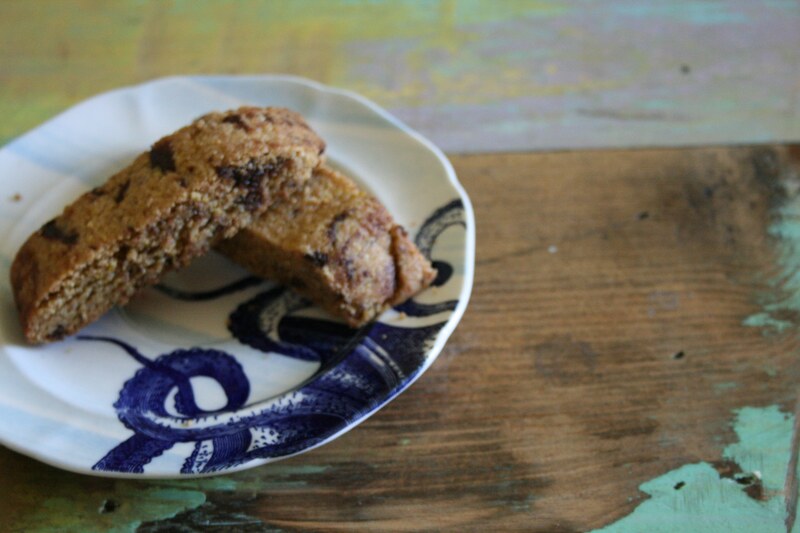 These biscotti are usually the first thing I whip up every year when my harvest is dry enough to grind. Mix together the dry ingredients- flours, cornmeal, baking powder and salt. Beat the butter and sugar until fluffy. Add the eggs one at a time, and then the vanilla, and beat until smooth. Add the sugar, combine, and then the flour in 3 parts. Then stir in the chocolate. Roll out into two log-shapes and bake for 15 minutes. Remove and allow to cool for at least 30 minutes (this step is important!). Then slice into biscotti shapes (about 3/4 inch thick) and stand up on the baking sheet. Bake at 350 for another 20 minutes, until golden brown. Store in an airtight container. They’re good for about 5 days, if they last that long. 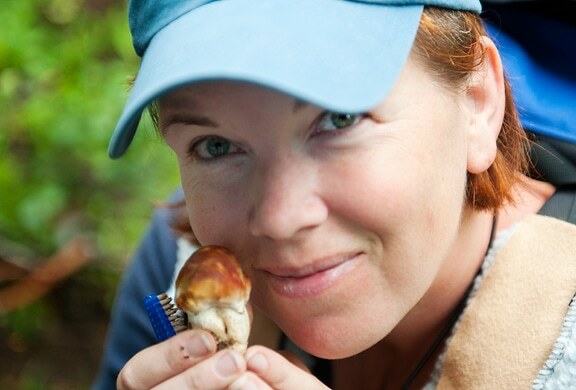 As a wild edibles teacher, I often encounter students who, like treasure hunters, desperately want to find exotic foods like mushrooms or high mountain wildflowers. However, as an instructor, my greatest happiness is in seeing people learn to love and use abundant weedy plants in their meals. Not only is there little concern about harming a delicate population with plants such as dandelion and lamb’s quarter, they are usually right at a person’s fingertips, maybe even knuckling through the ground of their garden. Easy to identify and possessing a pleasant lemony crunch, purslane (Portulaca oleracea) is a perfect wild plant to welcome into the kitchen. 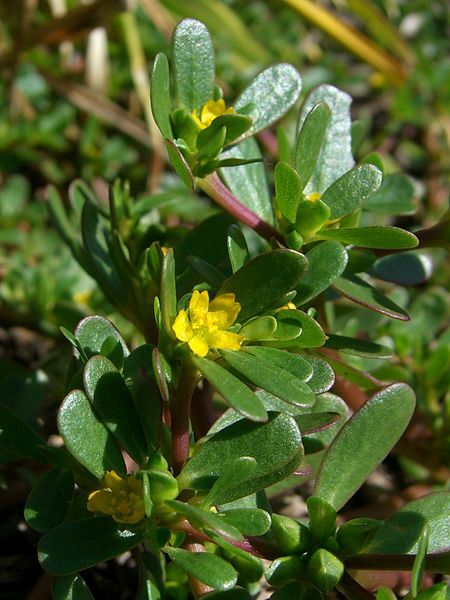 Still revered today in places like the Mediterranean and Mexico, purslane can be eaten both raw and cooked. When utilized raw, purslane can be added to sandwiches or salads. Try tucking a little purslane into your potato salad, or between the layers of your caprese salad. It is particularly lovely paired in with tomatoes, cucumber, avocado, and a vinaigrette. You can also roll purslane into your summer rolls and sushi. It makes a very pleasing pickle that soaks up flavors nicely and remains crunchy. Purlanse is also a versatile ingredient in cooked dishes. It offers a citrusy tang and also works, much like okra, to thicken cooked foods. I often cook purslane into green salsa, and either serve it cold with chips, or stewed in the crockpot with a roast. If you’re not sold on what purslane can add to your culinary repertoire, perhaps you’d add some to your diet for the sake of nutrition alone. If you regularly consume purslane, you might just be able to do away with those expensive supplement that are lining your medicine cabinet. Purslane offers the highest plant-based source of Omega-3 fatty acids, and is also packed with vitamins A, B, C, E, as well as calcium, magnesium, and potassium. If you’ve ever weeded it out of your garden, you will likely have no problem identifying purslane’s crawling nature and succulent leaves. Though it prefers to grow in a place with a little moisture (like that garden you water on a regular basis), purslane can also grow in dry soil. It continues to sprawl across the ground in the heat of summer and form mats. Both its oval leaves and round stems are fleshy and moist, like cactus paddles, and exude a clear juice when cut. If you look very closely, you may be able to see purslane’s tiny yellow flowers, and even smaller seeds, which sit in a little cup like eggs in a bird’s nest. Unlike many plants, purslane remains relatively tender as it matures. 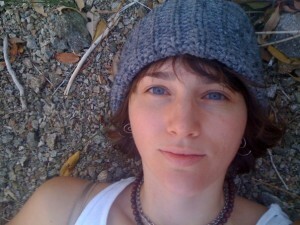 If you have access to a healthy patch of it, you can select only the most tender tips. However, if you’ve only a small spot of purslane, don’t hesitate to eat the older leaves and stems. If you can easily cut through them with your fingernail, they will still be pleasant to eat. This recipe, adapted from Paula Wolfert’s The Food of Morocco, won’t win any beauty contests. But if you enjoy strong flavors like tapenade, you’ll love this bold condiment made with purslane. 1. Chop the garlic and salt together, then use the edge of your knife to crush them into a paste. 2. Heat the olive oil in a large skillet over medium heat. Add the garlic and salt paste, paprika, and cumin and stir continuously until they become very fragrant. 3. Add the chopped herbs and purslane, and stir them until they are nicely coated with oil. Add the water, put a lid on the pan, and let the herbs and purslane cook until the water has all evaporated. 4. Remove the pan from the heat, and let it cool for 10 minutes before stirring in the lemon juice, preserved lemon, and olives. 5. Serve either warm or chilled, as a condiment. It is particularly nice with a loaf of crusty bread, or as a veggie dip. LOVED this article! Fascinating and inspiring. The photography is absolutely beautiful. Thank-you! I’m so glad you enjoyed it!! This is such an inspiring line-up of herbalists, and I’m really excited to have the chance to showcase their work. 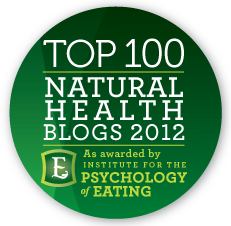 Fabulous recipes and inspirations! My moth is watering and my mind is formulating. Thanks so much. Fabulous recipes. One for my archives. Thanks. My pleasure – this one is going in my archives as well! I just love this so much! All the artistic soulful expressions of these wonderful herbalists through their kitchen creations is so inspiring! Thanks so much for sharing it with all of us. 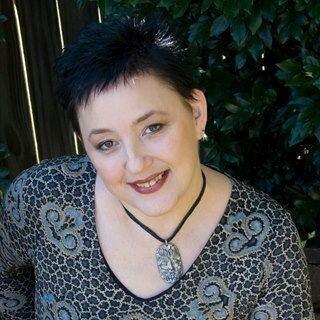 I was also very inspired by this article – soulful and artistic is a perfect description! 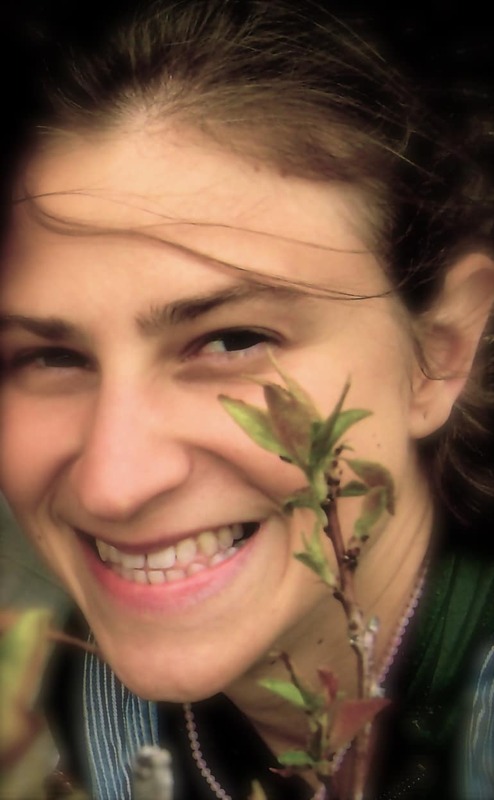 It was such a pleasure to feature these talented herbalists. Can’t wait to try the elderflower cordial. Let us know once you’ve tried it!